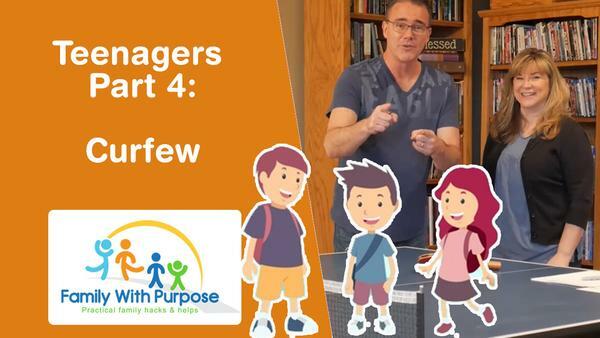 In this video Tammy and Barry with family with purpose will discuss tips on parenting teenagers and having curfews. Effective parenting can be a challenge when you have teenagers. Parenting mistake we should avoid. Raising teens can be difficult but these simple tips to parenting are invaluable. Parenting tips for teenagers and parenting teenage son or parenting teenage girl or parenting teenage daughter. Consistent parenting is the key to a successful relation with your teenage kids. Parenting teenagers funny yes but also can be serious just need the right tips. Being more involved in your teenagers life. Family Values are most important. Family hacks that work for your teenagers. Curfews are good and curfews are bad listen to why on both accounts. These simple rules for teenagers are easy to follow for parents of teens. Top parenting mistakes are often when parents have curfews. Should teenagers have a curfew? Simple Advice for parenting teenagers. Give Them rules to follow.